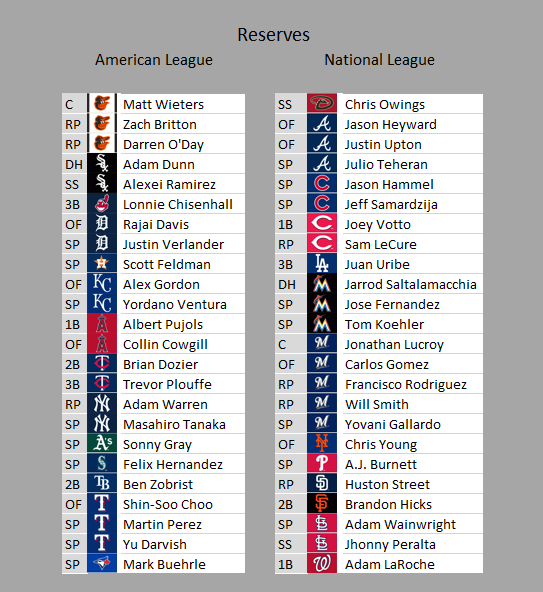 For the starters, I simply selected the player with the highest WAR (according to baseball-reference, aka rWAR) at each position, including one starting pitcher. 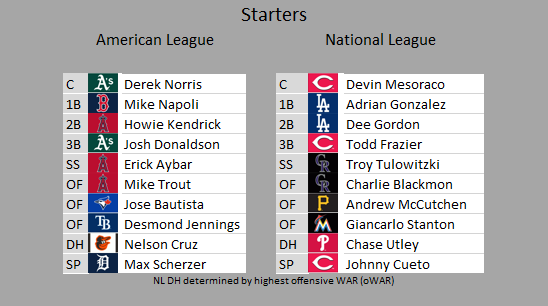 For the NL DH, I selected the player with the highest offensive WAR that wasn’t already at a different starting position. For the reserves, I first selected the player with the second-highest WAR at each position. For pitchers, I selected the four next-highest starters and the top three relievers (you’ll notice these aren’t necessarily closers). I then accounted for any teams which didn’t already have a player represented and chose the player from their team with the highest WAR. For the remaining spots, I chose the next-highest WARs across all teams and positions, with a total of 13 pitchers on each roster. See some notable absentees? Perhaps guys from major market teams who are going to get voted in based on popularity not how good they are this year at baseballing: David Ortiz. Derek Jeter.